Vladimir Putin is coming to town. His hosts are expecting $20 billion in new contracts, but what does he want in return? The capital of Uzbekistan has gone Russian for the week – even the weather has turned cold and snowy. Tashkent is decked out in red-blue-and-white flags. Roads in the center are lined with billboards carrying the words: “Welcome Russian friends!” Even buses have been emblazoned with the flags of Russia and Uzbekistan – an unprecedented sight. This outpouring of Russophilia is in anticipation of President Vladimir Putin’s two-day visit, which begins on October 18. The expected headline takeaway from his stay will be the signing of $20 billion worth of commercial contracts. The late Uzbek leader, Islam Karimov, who died in September 2016, was never an enthusiastic comrade for Moscow, so the bonhomie is being interpreted by some observers as a historic turn by Tashkent. A more sanguine reading is that President Shavkat Mirziyoyev is cultivating equally warm ties with all and sundry in his ongoing mission to pull his nation out of its long-standing isolation. This fits an established pattern. Last April, an agreement was signed between Russia and Uzbekistan on expanding military-technical cooperation, which envisions the mutual supply of military wares, the maintenance and repair of weapons and military equipment, and assistance in research and development. Uzbekistan has also recently resumed sending military personnel to be trained at army colleges in Russia – an arrangement that was ended in 2012. This year, 340 Uzbek officers enrolled at the colleges. And Russia has been supplying weapons to Uzbekistan at reduced prices since 2016. Uzbekistan is the only non-member of the Moscow-led Collective Security Treaty Organization, or CSTO, to enjoy that privilege. This has some suspecting that Uzbekistan may break from form and begin to show interest in Moscow-led bodies. “I would not rule out the possibility of efforts being made to draw Uzbekistan into the CSTO and the Eurasian Economic Union. It seems that Mirziyoyev is shifting from the position occupied by Karimov, who distanced his country from these organizations,” political analyst Alisher Ilkhamov told Eurasianet. Perhaps the most significant development to occur this week will be the start of a project to build an $11 billion atomic power plant. 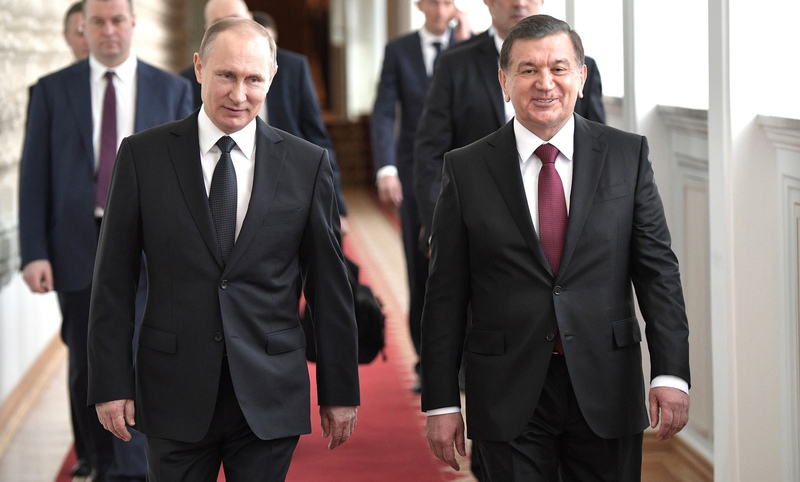 Putin and Mirziyoyev will travel to the construction site near Tudakul lake, just east of Bukhara, on October 19. The deal underpinning the project, which is being jointly executed with Russian state-run nuclear power company Rosatom, was signed in Moscow in September. The 2.4-gigawatt power station is slated to come online in 2028. That is a colossal amount of electricity, but not everybody is happy. “Does Uzbekistan even need an atomic power plant? I can still remember the Chernobyl accident. Maybe it is better to invest in alternative power, [the resources for] which we have enough of. Karimov would not have allowed this,” 63-year-old retiree Nuriddin Khamrayev told Eurasianet. Shukhrat Ganiyev, a political analyst from Bukhara, likewise said that his fellow Bukharans are concerned and unhappy about the prospect of living so close to an nuclear power plant. An unscientific poll conducted by Ganiyev among local residents revealed widespread anxiety. “Our city gets freshwater from Tudakul, so what is the sense of building an atomic plant so close to this ancient city? This issue needs to be discussed in society, in the media and on social media. Why are Uzbekistan’s environmental activists silent?” Ganiyev said. Another large Russian project will entail resuming the construction of an astronomical observatory on the Suffa plateau, a high-altitude spot around four hours’ drive south of Tashkent. It is believed the observatory, begun in late-Soviet times and then discontinued, will house the world’s largest radio telescope. The signing of a roadmap on this undertaking is on the agenda during Putin’s visit. Even though Karimov adopted a cool stance toward Russia, it was not the same for many of his countrymen, millions of whom were forced by necessity to travel there for work. With bureaucracy complicated for those migrant laborers, large numbers risked legal trouble by working without the proper authorization. Under Karimov, authorities turned a blind eye to all this. Mirziyoyev has taken a radically different tack and focused much of his diplomacy with Russia on easing work-registration requirements for Uzbeks. His government is coordinating more closely with Russian migration authorities and has opened several new consulates to better assist expatriates. The payoff has been impressive. In 2017, labor migrants from Uzbekistan transferred $3.9 billion from Russia to their homeland. That was 42 percent more than the year before. Mirziyoyev wants to see other areas of the economy benefit from this cordiality too. The goal is for trade turnover to hit $5 billion this year. Already in the first seven months of 2018, trade turnover increased by 32 percent compared with the same period in 2017. Russia's share of foreign trade with Uzbekistan stands at 18 percent. That is a lot, but Russia is nonetheless second to China, and that’s an important distinction. Indeed, analyst Rafael Sattarov believes it is unlikely Uzbekistan will join the Eurasian Economic Union, not least as the government has made no changes to its foreign policy concept since August 2012. “[The document] clearly states that the country will not join military blocs and integration associations that hinder sovereignty, or integration projects in the post-Soviet space that hinder relations with third countries,” Sattarov explained. So even if Russia is courting Uzbekistan eagerly, the likelihood for the time being is that Tashkent will avoid forging any exclusive relationships. Mirziyoyev earlier this month traveled to Paris, his first official trip to a member of the European Union, and he was in India a few days before that. In May, he met with Donald Trump at the White House. His first state visit outside the former Soviet space was to China, in May 2017. Nigara Khidoyatova, an independent politician who has lived for several years in the United States, said that despite the positive dynamic in Russian-Uzbek ties, the broader trend is toward maintaining relations among all the country’s major partners on an equal footing. “For now, Shavkat Mirziyoyev is […] trying to keep a balance between the three strong players – China, the United States and Russia. That much was demonstrated by the president’s visits to the West,” Khidoyatova said.